2013 Rittenhouse WNBA showcases the best player's in the league. Sticking with the format of the previous release, it comes in the form of a factory set. It's also bolstered by a pair of autographs, one of which comes from one of top prospects ever in women's basketball. The checklist for 2013 Rittenhouse WNBA aims to provide somewhat equal coverage to all 12 teams in the league. Each has at least six cards in the 100-card set. 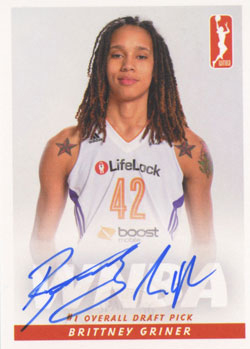 Included are the first WNBA cards of rookies Brittney Griner, Elena Delle Donne and Skylar Diggins. Each set also comes with autographs of Griner, who is seen as having the potential to be one of the best women's basketball players ever, and Delle Donne. 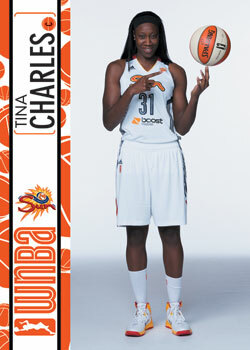 The 2013 Rittenhouse WNBA basketball card set is limited to 500 copies. 2 cards. Both included with sealed factory set.